British Car Auctions will be holding its first Vintage and Collectors Vehicle Sale at its brand new Bedford auction centre on Wednesday 12th October. The sale starts at 13.00 with viewing from 9.30 on sale day and from 13.00 – 17.00 the day before. Entries include this rare 1951 Kaiser Special Sedan with a 3.7 litre Continental straight six, built by Henry J. Kaiser (the man who built more Liberty ships then the German U boats could sink). 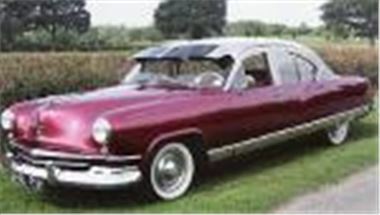 The Kaiser is conservatively estimated at £6,500 - £7,500. Also in the sale, a fabulous right hand drive 1938 Buick 8 Series 40 Trunk Back sedan, estimated at £15,000 - £17,000. If you want to buy real quality and advanced engineering in a 1930s car you can’t beat a Buick. Another unusual American is a RHD 1941 Hudson Six Club Coupe, which spent most of its life in South Africa. It’s estimated at £6,000 - £7,000. There are also plenty of fun cars in the sale. A1969 Mini ‘woody’ Countryman with 1275cc running gear, disc brakes and Minilight wheels, estimated at £2,950 - £3,500, a 1976 TVR 1600M with engine mods to 138bhp estimated at £3,750 to £4,250, and a 1989 TVR S2, estimated at £4,250 - £4,850. Top condition cars include a concours winning Cortina 1600E, a near perfect 1954 Triumph TR2, and possibly the best RHD Mercedes 190SL available, even registered ‘190 SL’. Late entry: Fully equipped ‘Green Goddess’ fire engine.